When Canon announced its compact EF-S 24mm f/2.8 STM lens for $149, the only real question was its performance. And now we have more information about that too. "Image quality is very good. Centre sharpness is excellent even at the maximum aperture, and almost as impressive at the edges of the frame. Chromatic aberrations are fairly well controlled, although there's obvious vignetting at the maximum aperture and some barrel distortion too. The lens doesn't ship with a hood, although it didn't really exhibit any unwanted flare effects." They went on to give it 4.5 stars, stating that "We can strongly recommend the Canon EF-S 24mm f/2.8 STM as an extremely small and lightweight prime lens for APS-C DSLR owners that won't break the bank." I think this optic would be particularly attractive to Rebel and 70D owners. You can read all the details for yourself over at PhotographyBlog.com. I've been using the Lumu light meter for iPhone since it was first released. Using the dongle along with the Lumu Photo app, I could employ my smartphone for incident light measurements. Now, with version 2.0, photographers can take reflective readings too - no dongle required. Lumu Photo uses the iPhone's camera for reading the light. So all you have to do is download the app, fire it up, and start taking meter readings. And if you need spot readings, just tap on the screen in the area that you want to measure. Lumu Photo can be a lifesaver for analog film shooters with non-metering cameras. But this app is also handy for evaluating scenes, double-checking your camera's light meter, and of course, taking incident measurements if you have the Lumu dongle (which happens to be on sale at the moment). I tested the performance of the reflective meter with an iPhone 5S, and the readouts were very accurate, producing excellent exposures. The app also includes the ability to save meter readings, along with location data, and your notes via iCloud, then synced across devices. Again, great for scouting missions for both photo and video projects. Speaking of which, Luma also makes a Video and Pinhole app. Note: Now that Black Friday is over, so is the special price for this kit. It does, however, remain in the store at $34.95. A great deal in the Nimble Photographer Store for 24 hours only - the Walking Man Shoulder Bag + Dual-Function Stylus Pen + microfiber cloth - entire kit for $19.95 (regular $34.95). Here's more about it. Take the stairs instead of the elevator - You're light on your feet with the Walking Man Shoulder Bag slung across your back. The Black Friday Sale Price is effective until 11:59 PM on Friday Nov. 28th. Offer good while supplies last. I was just contacted by the folks at Ghost Drone, letting me know that they have an IndieGoGo project going that can get backers flying for as little as $375. The other thing that caught my eye, as a potential pilot with no experience, is that they claim that the Ghost "is the world's easiest drone to fly. It is perfect for first-timers and experienced pilots alike." OK, you've got my attention. The basic kit doesn't include a gimbal (stabilizing camera mount), so it's more for learning to fly, then you can add your own gimbal later if you wish. But if you're willing to back the project for $599, you get everything your need to mount a GoPro camera to the Ghost and start recording images and video from above. If you don't have a camera already, there's a $979 package that includes the Ghost Drone, gimbal, and GoPro4 Silver Edition. This is considerably less than the DJI Inspire-1 for $2,800 (without controller) that I wrote about last week. Speaking of controllers, you don't have to buy one for the Ghost Drone because it uses an iPhone or Android device to control it. The software is free. "Travel light with just your phone, and let Auto Mode do the flying, so you can focus on generating the perfect shot. Point your finger on the map, and the drone flies to that spot. No bulky RC controller to carry around. Just your phone and a small G-Box." Ghost is going to send me the $375 basic kit in January so I can test it. My backing is this blog post. Their focus at the moment is trying to raise as much capital as possible via the IndieGoGo project, which is open only until Dec. 10, 2014. If you want to try your hand at ariel photography, but have been nervous before about your skill level or making a big investment, there are still good deals available for backers. Then we'll all get together in February and compare notes. As we wind down 2014, many photographers are thinking about year-end purchases and gifts. For those who appreciate quality and nimbleosity, I've published my recommendations for mirrorless and premium compact cameras in the post, The Gift-Giver's Guide to Premium Compact and Mirrorless Cameras on the lynda.com Article Center. The guide is organized by four categories. Here are those categories and an overview of the cameras that I think have the right stuff. Panasonic Lumix DMC-GH4 4K Mirrorless Micro Four Thirds Digital Camera (Body Only) On sale right now for $1,497 and a $50 B&H gift card is included. Canon PowerShot S110 Digital Camera (Black) $249 with free SanDisk 16GB SD card (offer ends Nov. 26). You can read all about these recommendations over at lynda.com Article Center. 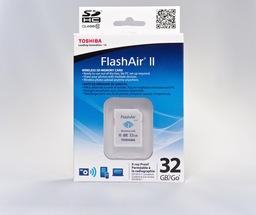 When I needed to photograph the Toshiba FlashAir card for my review on c't DigiPhoto, I used the Fotodiox FlapJack LED Edge Light ($299) for the shoot. And I have to say, this nimble, diffused light is making my job a lot easier. What separates the Fotodiox from other LED units I've used is the built-in diffusion, eliminating the need for a softbox. The LED bulbs aren't pointed directly at the subject. Instead, they are angled inward with the light reflected through diffusion material. The result is a soft, beautiful illumination. For the FlashCard shoot, I put the product in a collapsable mini-studio and used the Fotodiox light for the front illumination. I added a smaller traditional LED panel pointed at the backdrop to keep it nice and bright. 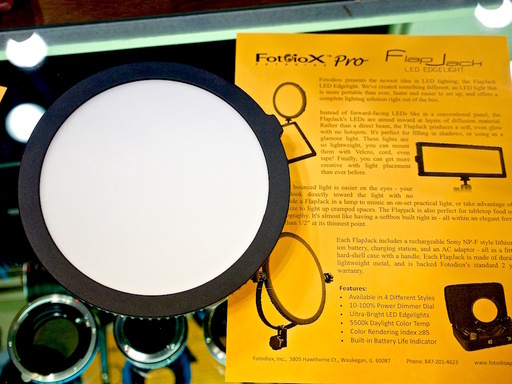 The Fotodiox is battery-powered (although the kit includes an AC adapter if you want to use it). I leave the Flapjack mounted on a light stand so I can position it anywhere I need without concern about cords. The Fotodiox also includes a built-in dimmer, so I can easily balance the foreground illumination with the background to get exactly the look I want. And since the output is color-balanced for daylight, I can leave my camera in Auto White Balance mode without worrying about unsightly color casts. All of this adds up to fast, easy, and attractive product photography. As much as I like the Fotodiox Flapjack for portrait lighting, it's even better for knocking out product shots. Once you've captured the photo, finish it off in style. My post-production tutorial Enhancing Product Photography with Aperture is chockfull of tips and techniques that will help you make your products shine. 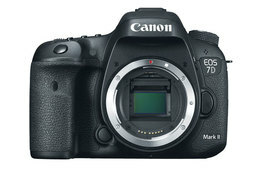 RAW support for the Canon EOS 7D Mark II, Fujifilm X30, Nikon D750, and the Panasonic LUMIX DMC-LX100 were added to the Apple ecosystem that currently includes iPhoto, Aperture, and Preview. Digital Camera RAW Compatibility Update 6.01 is currently available in the Mac App Store. This update requires Mac OS X Yosemite. Adobe incorporated its Aperture/iPhoto Import Utility into Lightroom 5.7. And it works well. But a little preparation in Aperture will provide you with the best results possible. 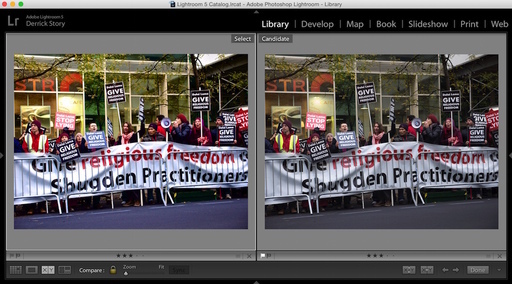 Imported Aperture files in Lightroom 5.7 - The edited RAW file is now a Jpeg displayed on the left. The unedited RAW file is on the right. 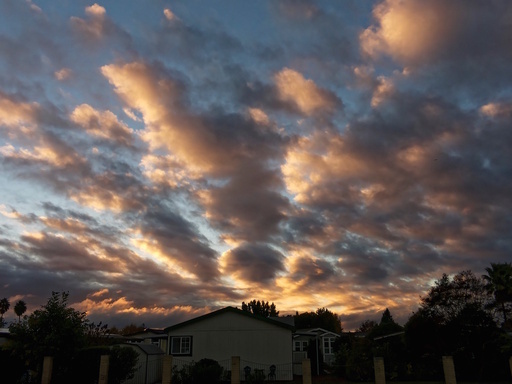 Both images were imported into Lightroom using the Adobe utility. The size and quality of the image on the left was determined by the Preview Settings in Aperture prior to import into Lightroom. Since Lightroom can't imported the adjustments to RAW files (only the RAWs themselves), it provides you with the option to import Jpeg versions of your edited RAW files, along with the master RAWs themselves. I cover how to set this up in the article, How to Import Aperture Libraries into Lightroom 5.7 published on ct-digiphoto.com. The real key for Aperture users is to regenerate their Jpegs that are being prepared for import into Lightroom. Most of us are using Aperture previews set to a constrained size, such as 1920x1920 or 1440x1440. This makes sense in terms of managing disk space on our computers. The problem is, if we don't regenerate these Jpegs to "Don't Limit Size" and to a higher quality setting, such as "10," then the edited files that are imported into Lightroom won't be maximum quality or resolution. You can correct this by regenerating your previews using these settings in Aperture's Preferences (Aperture > Preferences), Photo Preview: Don't Limit, and Photo Preview Quality: 10 (High). Click on the image on the right to see how this looks. To generate new previews using these parameters, hold down the Option key and go to Photos > Generate Previews. Depending on how many previews you're regenerating, this can take a while. Monitor your progress via the Activity window in Aperture (Window > Show Activity). An easy test to make sure this worked is to drag a thumbnail out of Aperture to the Desktop. Open it in Preview, and use CMD-i to bring up the General Info box. There you can see the dimensions of the current preview in Aperture. By regenerating full size previews, the pictures you so carefully edited in Aperture will be imported into Lightroom as Jpegs at their maximum dimensions with high quality. The edited preview receives an augmented file name, such as "PB020248_Aperture_preview.jpg" to help you identify it. Plus you'll get the original RAW, if there was one. I highly recommend that you do a test run with a small Aperture library to ensure that you've prepared properly. Once everything passes muster, you're ready for the big import. Keep in mind, that you only have to go through this laborious task if you were planning on moving to Lightroom anyway. A much easier transition to Apple's Photos app is on the horizon. And that move will keep all of our adjusted RAW files intact, plus library structure and metadata. Stay tuned for news about that right here on The Digital Story. I was just reading the excellent review of the Panasonic Lumix DMC-LX100. This is a camera for which I have serious lust. 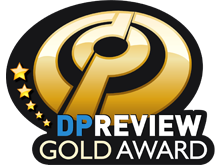 And that desire was intensified by the Gold Award bestowed upon it by DP Review. 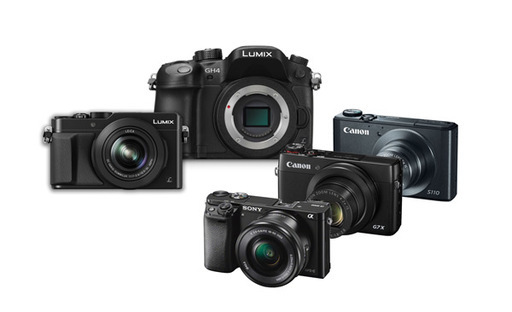 Since the LX100 is a new form factor, however, I'm also reminding myself that I need to experience it physically before dinging my credit card for $800. Why? Because good on paper doesn't always mean good in the hands. "I was like a kid waiting for Christmas on the day it was to be delivered. But as soon as I opened the box and picked it up I experienced immediate disappointment. It just didn't feel right in my hand; it felt awkward. I couldn't believe how 2-3mm here and 2-3mm there and only ~2-3oz more had so drastically changed my wonderful and most used LX camera. It no longer just slipped into my hip pouch, I had to consciously angle it in and it felt surprisingly heavy in my vest pocket." Ed ultimately sent back the camera. His experience is something to keep in mind in this online world. When I upgraded from the Canon 60D to the 70D, I was pretty confident that I would like the new camera. That's a purchase I could make online right away. But I also know that's not always the case. Trade shows, friends with gear, and physical camera stores can help me evaluate new form factors. (If you try at a camera store, BTW, they deserve the sale.) Yes, we can usually return the item if necessary. But as with photography itself, it's best to get it right the first time.